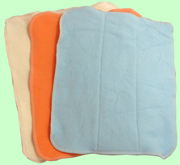 Pack of 3 large organic prefolds- includes 1 tangerine, 1 baby blue, and 1 natural. Each prefold has hand-dyed organic cotton on one side (undyed cotton for the all natural prefold) and organic velour on the other. An organic cotton fleece soaker is sewn inside between the two layers. Large prefolds measure 14 in. x 16 in. We prewash our fabrics, but some shrinkage may still occur.